A press release from Intel today has clarified the state of the 3D XPoint Joint Venture the company has with Micron. Currently Intel and Micron co-developed the new class of non-volatile memory, with manufacturing at the Intel-Micron Flash Technologies (IMFT) fab in Utah. Intel’s statement today states that for the second generation of memory, the development will also be a joint effort and is expected to complete in the first half of 2019. However the third generation will be developed independently, allowing each company to focus on the separate business needs. 3D XPoint technology, branded as Optane by Intel and QuantX by Micron, has been a mini-revolution when it comes to non-volatile memory. Intel’s Optane products, mostly storage but with recent announcements about DRAM, have seen a sizeable uptick in interest from specific enterprise markets that can benefit from persistant data or fast random access storage. Intel is expected to launch its DRAM products alongside its next generation server architecture at some point in the new future. Under the terms of the joint venture, each company gets 50% of the flash memory made at the IMFT fab in Utah. Micron’s QuantX has not been released, which raises the question as to who has been buying it. Intel has long held that 3D XPoint has a long life ahead of it, offering speed, density, and a wide range of applications. The industry is still waiting to be fully exposed to Intel’s initial promises about the product, from storage to memory, but also future generations of the product, such as adding layers and capacity. As with all technologies, these things are generational, and today’s announcement states that Intel and Micron are still working jointly with the second generation product. The completion of second generation 3D XPoint is expected in the first half of 2019, but then R&D focus will shift to completing and finalizing the third generation. It is this generation that is the focus of the announcement: the companies will no longer work together for it. This means that both companies will have a chance to adjust their roadmaps independently, either pursing a more aggressive strategy, or none at all. The note also states that the memory will continue to be built in the same fab, which raises questions as to how the joint venture will work in that case, if the research is done independently. Both Intel and Micron have been having problems of late, with Intel’s Optane DRAM being released later than originally promised, and Micron having issues with the Chinese government, as well as disappointing sales of its own 3D XPoint. At least some clarity is being given to the 3D XPoint side of the businesses, if only to shine a light on the nature of the agreement for the next few years. I remember it like yesterday, when HP announced Memristor based DRAM replacement ready in 2016 with 1000x capacity over DRAM, same speed yet true non-volatility four years ago. 1000x Capacity was to be done via layering (linear cost) and energy not an issue because only access would involve it, not storage. My immediate reaction was that HP might die for the business such a product would kill, before they’d be able to put it in the market: HP was still pushing a lot of storage in those days. The other instinctive reaction was that compute wasn’t going to be anyway near ready with 1000x random access memory capacity and that it would have to move into the RAM itself to have any chance of getting value out of the technology. I also very distinctly remember Martin Fink, Meg Whitman, Brian Krzanich and Satya Nadella sitting around a table discussing how the Memristor was going to change the world. It was quite obvious right there that Intel’s enthusiasm didn’t match that of HP nor mine. When they announced their own NV-RAM technology some time later, the first thing that was obvious was that they wanted it to fit right between low-end DRAM and high-end Flash, which would have been just perfect from a business point of view. But the Memristor at the same time proved, that brand new base technology doesn’t just grow into its assigned niche, but can step on dozens of feet right and left: The memristor seemed destined to roll up all downward storage tiers both in price and performance and kick right up into logic, where it could outperform silicon gate-by-gate using a more powerful form of logic. Well Optane so far failed to fill its assigned niche and the Memristor failed to leave the labs, but somehow I missed the story behind: What happened to the Memristor? Is Optane/X-point in as much trouble as the 10nm process? What you need to remember about HP (and this is the reason I love HP...in fact, the ONLY reason) is they are an engineering house not that different from IBM. HP's focus on engineering is completely different than IBM though, where the later is focused on patents, and former is focused on concept. HP is an incredible place to work for this. When you hear about the famous Meg Whitman\Mark Hurd layoffs though the last two decades, it was literally trimming the fat. Engineers aren't the fat. Marketing, sales, service\support, and other low-level positions are the fat. Sure engineers makes substantially more than someone in service, but there are far less engineers consuming the budget, and engineers, in HP's (and my) mind are not expendable. The company has excellent retention and values their real employees. Case in point, look at Compaq. NOT A SINGLE ENGINEER WAS LET GO during that merger. HP wanted those guys, and a lot of them are still there. Even the Itanium guys have been shifted to new projects, and a lot of them actually worked on Memristor going back nearly two decades when HP was looking to make faster flash storage and higher density DRAM. First: Not sure when your memory is from, but I doubt they had to contend with pseudo-SLC 3d NAND flash. That's basically eliminated the niche between NAND and DRAM, at least as far as SSD caching goes. 3Dxpoint would have taken off a lot better without that tech, although I'd love to see the stuff cache the NAND drives as sort of a nonvolitile memory buffer (assuming the optane was close enough to the CPU to act as memory. See problems with that below). Second: Intel has real competition now, but is still clearly on top. 3Dxpoint may well be a fairly disruptive tech, assuming it can begin to replace DRAM. If the cost of populating a server with memory drops by half or more, you don't have to buy the absolute highest performing CPU for it at a 10x premium. An EPYC or possibly an ARM server will make a ton of sense. I'm fairly sure I've seen reports of less than honest OEMs providing 3dxpoint and calling it "memory", and this would even more or less work (say 80% performance of DRAM) assuming you filled all the channels with DRAM (this doesn't seem possible for said OEMs). The big gamble in doing this "for real" is that you are either stuck with using the DRAM as "real memory" and the optane as "virtual memory" or you have to fully build a proper memory system with a huge set of tags for all your DRAM and fill it like cache (which is certainly not what we are seeing from Xeon motherboards). Those tags are *expensive*, and stuffing them into DRAM means that you have to have built the DRAM interface to use it as such (your memory gets all offset). You also have lots of issues that you can't use multi-way caches with tags in the DRAM. 1. Enterprise. Actually this one makes sense. There must be plenty of systems with databases in SSDs for the simple reason that they couldn't find a system that would hold that much memory (and it would be a tad expensive). 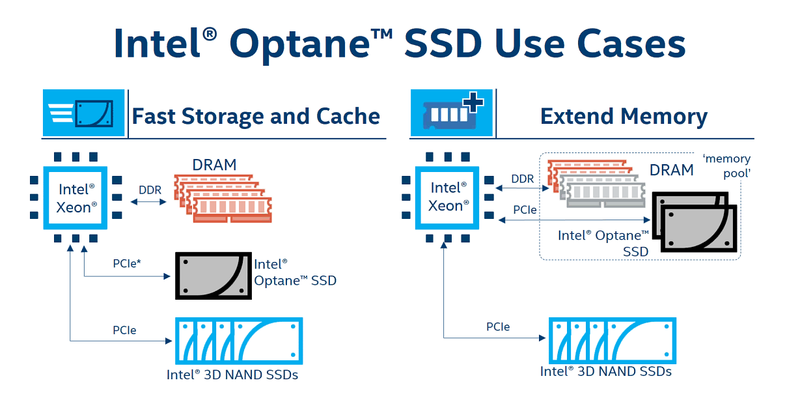 I'd expect Optane to sell in plenty of SSD-limited systems. 2. Consumer. This unfortunately is a joke. Accelerating rotating hard drives with faster nonvolitile stuff made sense 10-20 years ago (and Intel's indifference to their old SSD-based system provided on motherboards shows just how important this is) but is mostly a joke now. I may like AMD's system, but that is based on the idea that you can get your entire working set of storage on SSD and keep the rarely used stuff on rotating storage. 1. Intel will stop 3D NAND production after third gen (96-Layers) because they are losing money due to scale of production (unlike Micron). Micron under Sanjay doesn't want to give it's technology to a competitor (yes, Intel is paying Micron for NAND development until third gen is finished). 2. Intel only has one big fab for NAND and that's the china one. Intel is going to convert that to 3D Xpoint. 3. Micron has the right to buy Intel's stake in IMFT for a very low price beginning 2019 (it's in every 10-Q and 10-K). They are probably going to buy it because Micron's timeline for 3DXpoint products hints at it. Micron is going to finish it's product development in second half 19 (just when 2nd gen XPoint is ready and Micron doesn't have to share development and production with Intel) and products will come to market in early 2020. I'm pretty sure Micron and Intel both want 3D XPoint in the same spaces. Micron wants to go after the data center just like Intel. Micron has been moving more aggressively into the data center with their NAND recently. As far as why the dissolution of the 3D XPoint partnership, it could just be because both Micron and Intel feel comfortable with the technology now and since they are the only two companies with access to it they will be competitors in that space.